Macro Enterprises is profitable, selling for below liquidation value, still run by its founder who has significant stock ownership and there is an impending catalyst that could significantly increase revenue. Macro is based in Canada and its main listing is the TSX Venture Exchange under the symbol MCR (C$2.15); they’re also listed on the American pink sheets under MCESF ($1.60). Unless noted, all numbers in this write-up are in Canadian dollars. Macro builds and maintains pipelines for the oil and gas industry in Western Canada. Not surprisingly due to the oil collapse, very few (if any) new pipelines are being built today. Their revenue has declined from a high of C$212 million in 2013 to a projected C$130-140 million for full year 2015. Because no new pipelines are being constructed, almost all of their current revenue is maintenance and integrity work on existing pipelines under master service agreements (MSAs). The silver lining here is that maintenance work is required by law on active pipelines which means they’re able to maintain pricing power even during a downturn. As proof of this, towards yearend 2014 one of their MSAs came to an end and was extended for three years at similar terms. Management has stated they expect gross margins to remain fairly close to where they were in 2012/13 (~22% vs 26% at the peak). This has been proven true through the first several quarters of the downturn. The big catalyst is the potential for liquefied natural gas (LNG) export terminals to be built on British Columbia’s west coast. LNG demand has been increasing worldwide since at least 2000 and is expected to keep increasing for decades to come. Much of this demand growth has been from Asia which has some of the highest LNG cost in the world. Exporting LNG from Canada and shipping it overseas would save the Asian countries significant amounts of money. Western Canada is estimated to have as much as 1 quadrillion cubic feet of natural gas reserves (that’s 1 million-billion by the way). Worldwide natural gas consumption in 2012 was 52.5 trillion cubic feet. Petronas has announced a conditional final investment decision for what would be Canada’s first LNG export terminal. The final condition that needs to be met is the Canadian government approving the environmental assessment. Petronas is hoping to have the export facility in-service in 2020. That sounds like a long way off, but thankfully pipeline construction is one of the first things that has to be done to bring a new export terminal online. Petronas already awarded the pipeline project (worth at least C$5 billion) to TransCanada. Importantly, TransCanada is one of Macro’s largest clients and Macro has an MSA with them. TransCanada is expecting to start work as early as this month with a completion goal of 2019. They may also be constructing a second pipeline that connects to the main line for an additional C$1.7 billion. 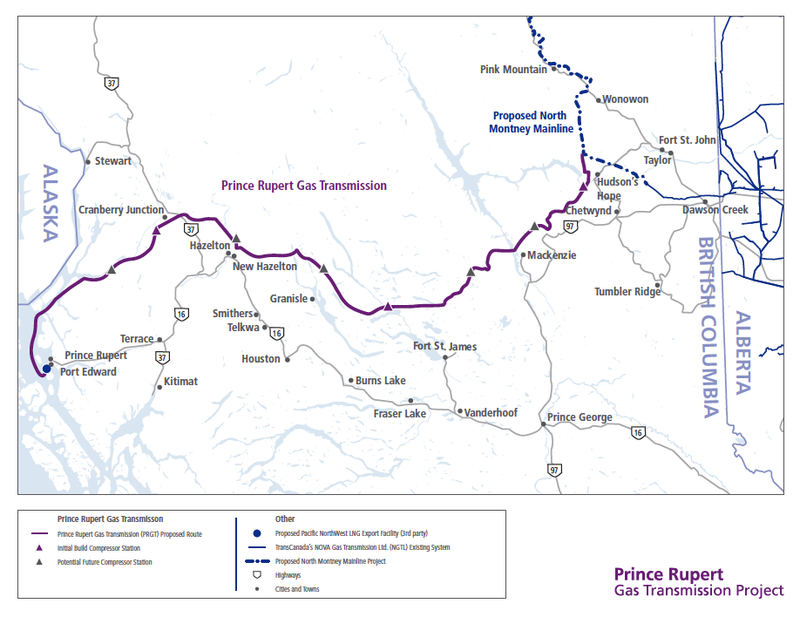 Below shows the roughly 900 mile pipeline that TransCanada will be constructing (the purple line). The blue dot on the left is where the Petronas export facility will be (labeled Pacific Northwest LNG on the map). In addition, Orca LNG is moving along with their plans to build an export facility in Prince Rupert, British Columbia. In July, Orca received their export license from the National Energy Board which is for a maximum of 1.3 billion cubic feet of natural gas per year. Their goal is to commence exports in 2019. Orca LNG and Petronas are the farthest along, but there are up to 18 total companies who are also pursuing or considering an LNG export terminal in British Columbia. A recent report in Canada claimed the most likely companies to build LNG export facilities are AltaGas, Shell Canada, Petronas and Exxon Mobil. Due to the oil collapse a number of these companies have delayed their final investment decision until 2017 or 2018. Macro recently closed on a C$115 million dollar credit facility with a local bank. Prior to this credit facility, Macro had debt outstanding of only C$14.3 million so this is quite an increase. Interestingly, Macro’s CEO, Frank Miles, has stated numerous times that Macro does not need any more funds to service their current projects. On the most recent conference call, Miles reiterated that this new funding will not be used for any small projects or maintenance work, only large scale LNG projects. The timing of raising this much debt just before one of their largest clients, TransCanada, begins a massive pipeline project is unlikely to be a coincidence. Frank Miles, Founder and CEO, owns 30% of common shares (36% if you include his convertible preferreds). His 9.1 million common shares are currently worth C$18.5 million compared to his total 2014 income of C$924,063. The other four directors own between C$300,000 and C$750,000 worth of stock and all senior management owns at least C$100,000 in stock. Total 2014 executive compensation looks high at 17.2% of operating income but this is mainly due to the downturn. Over a full cycle, compensation is very reasonable (total executive compensation was only 6.4% of operating income in 2013). In early 2014 Macro lost C$8 million on a C$19 million dollar project. According to Miles, they bid this project at a low fixed cost to form a relationship with a new client. Right from the get-go there was a delayed start time which caused them to lose workers and things snowballed from there. Because of this fiasco Macro has gone away from fixed price contracts and now focuses more on time-and-materials contracts (i.e. the client pays for materials plus a fixed hourly rate). This protects Macro from losing money on future projects that take longer than expected. It appears this was a one-time mistake but it’s worth keeping an eye out for more missteps. At the very least, Miles owned up to his blunder and seems to have learned his lesson. There are also a few related party transactions with two of their board members who run a law firm and an investment bank which Macro uses the services of. Canadian oil has been as low as US$24 a barrel as of late. Breakeven cost for Canadian oil sands projects that are already up and running range from US$10-$30 per barrel so it’s starting to get nerve wracking. If Canadian oil stays this low or continues lower it’s possible refineries shut down and the pipelines along with them. On the other hand, new oil sands projects that have already been green lit are continuing as planned. Suncor’s Fort Hills mine won’t open until 2017 but they’ve recently announced they’re going forward to completion. Once started, these massive projects have so much upfront capital committed that abandoning them is rarely an option. Fort Hills will produce 180,000 barrels of oil per day when complete. In addition, if a large LNG project is greenlit that Macro is a part of (like the Petronas terminal), that revenue should more than offset any lost revenue due to a refinery shut down (which I view as unlikely anyway). Revenue is also highly concentrated with Macro’s four largest customers making up 87% of sales in 2014. They have MSAs with Enbridge, Pembina, Spectra and TransCanada. One of these contracts has one year remaining on it, two have three years and one has four years. Losing one of these customers would obviously hurt, but again, an LNG pipeline project would negate those losses. I think calculating a true liquidation value as an outside investor is basically impossible, but that simple calculation shows the company is clearly cheap on an asset basis. Whether the actual liquidation value would be C$1.75 or C$2.50, the point still stands. Based on 2015 guidance they should earn at least C$0.19/share this year so they’re selling for 10.9x 2015 earnings. Keep in mind they’re almost 100% maintenance and integrity work right now, so if they don’t lose any of their MSAs this should basically be the bottom in terms of revenue they’ll earn in the near future. Without even getting into LNG potential, consider that Macro earned C$0.67 in 2012 and C$0.93 in 2013 (so the stock is at 2.3x previous peak earnings). As you can see, an oil recovery by itself has the potential to send the stock soaring. Pretty good news, but still a lot of uncertainty.